Gwen arrived in French Polynesia in 2009. 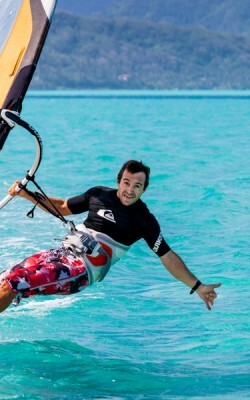 As a Windsurfer, he created the real first Windsurfing School of French Polynesia. Raiatea Windsurfing is still the only Windsurfing school of the « Fenua ». In 2012, he proposed to do some kayaking on the only navigable river of the country: the Faaroa River. In 2013, children could experience some sailing in the lagoon on small sailboats when adults could have some fun on Hobie Cat 16. Tupai’a Ecole de Voile is Gwen’s partner. 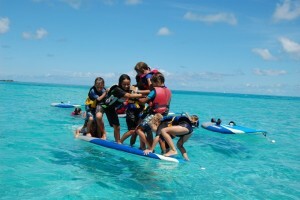 Through this collaboration, « raiatea-activités.com » is the largest activity center of Raiatea. INLAND ACTIVITIES :Truck tour on a very comfortable 4 wheel drive around the island with a stop at the Marae of Taputapuatea, the largest one of French Polynesia. Boat Licence Exam : to be safe and secure cruising the lagoon. Accommodation : try out our brand new bungalow fully equiped with a large bed, a bathroom, a kitchen and wifi access.